There are a couple different formula's I've tried and I shall attempt to explain the difference between the formulas. 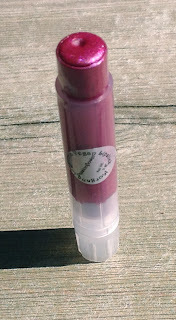 First there is the Lip Balm, a highly pigmented but slightly moisturizing lipstick. It doesn't feel much like a balm to me as there is good staying power with these. 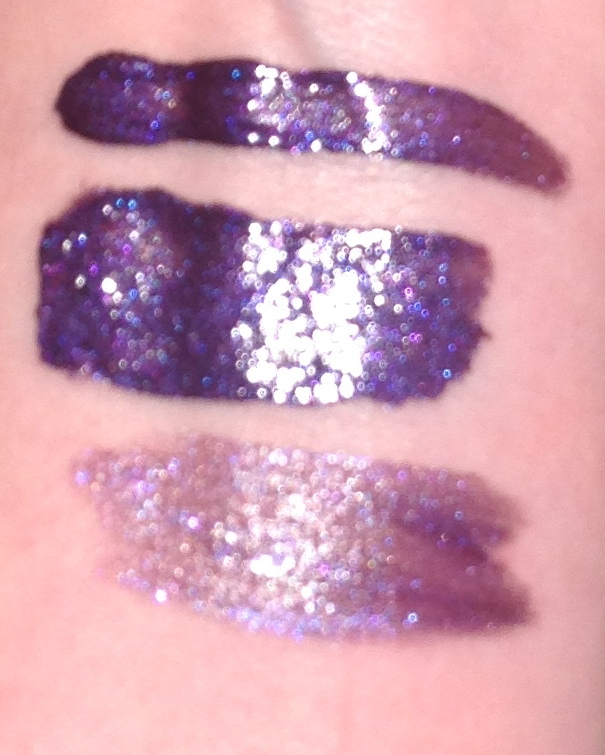 All of these are one shade with no shimmer or reflect to them. 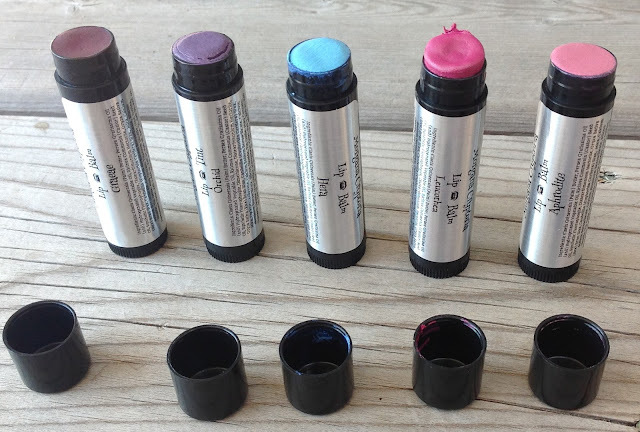 The Lip Tints are similar to the balms in packaging but go on much sheerer. They also have a moisturizing component to them. 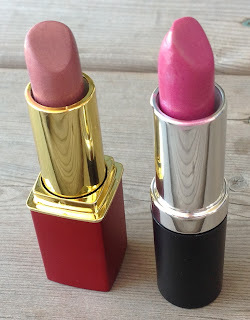 These very much do let your natural lip colour come through and are actually quite unique. 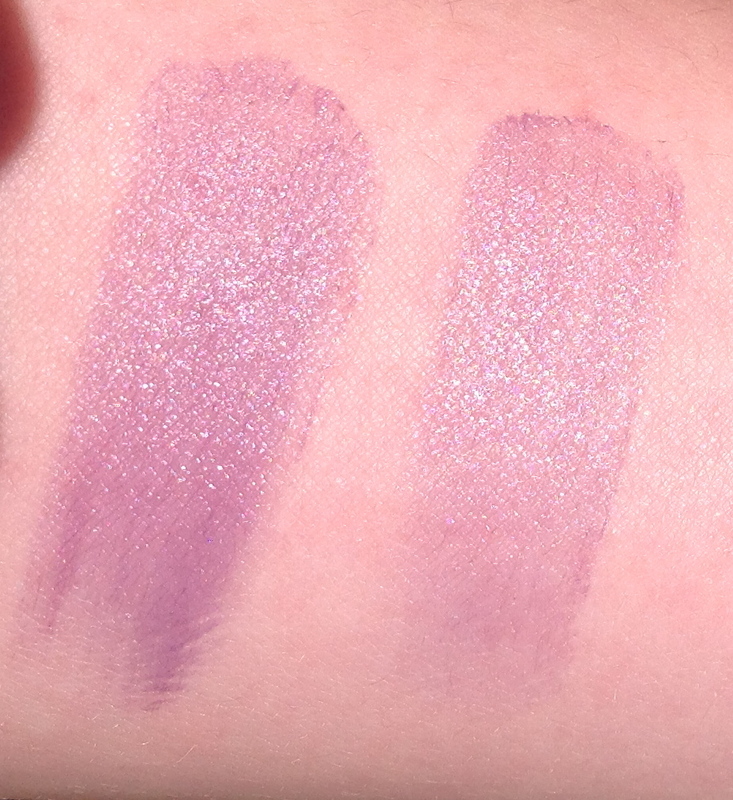 I found the Orchid shade to be quite interesting on. 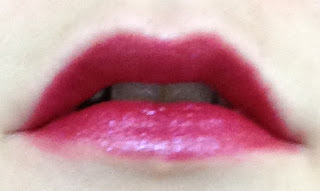 The lip gel gloss is non-sticky highly moisturizing and very cushy. I love the new lip gloss formula from this brand- much much better than the previous glosses they released. 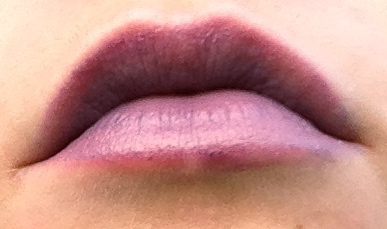 I did notice a touch of feathering with my very dark shade though and needed a clear lip liner. Also because it is so pigmented I found I needed to be careful when I put it on as you can easily tell if I didn't line it up exactly with my lip line due to how dark the shade I purchased is. There is also the slimline lipstick which is slightly more moisturizing than the regular lipsticks but less so then the balms. 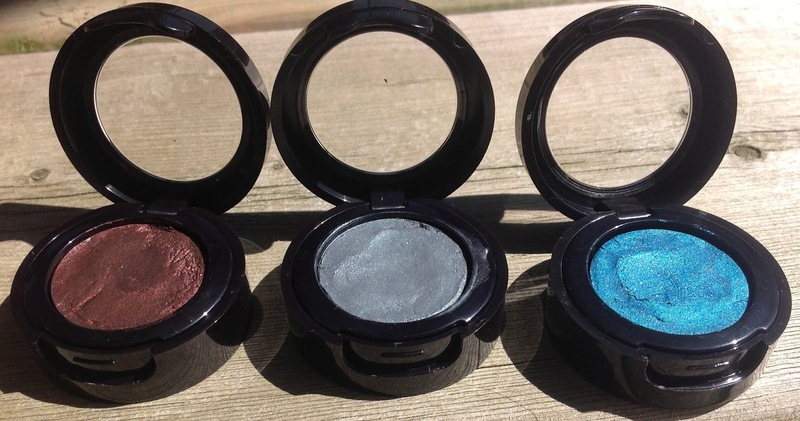 Also highly pigmented and with a shimmer. 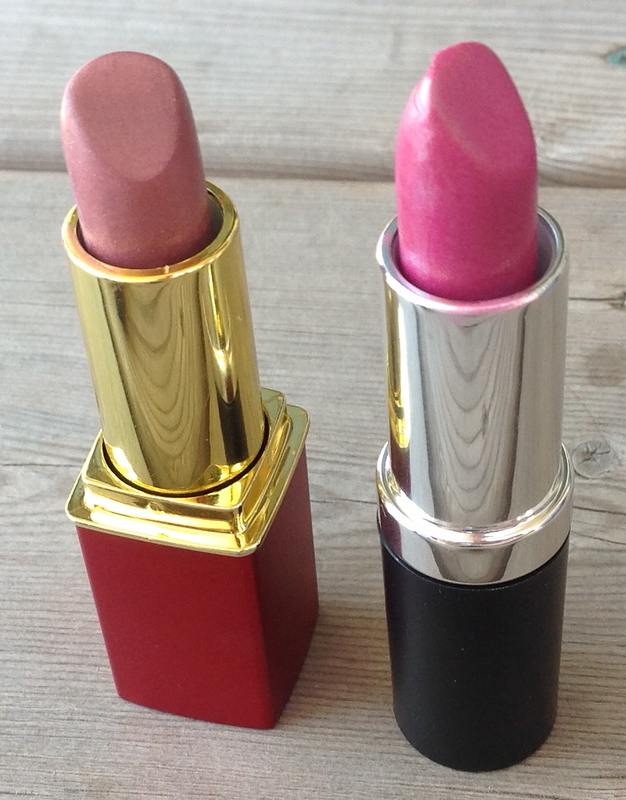 And finally the lipsticks which are semi-matte. They have high pigmentation and contain shimmer. They last a long time on, don't budge unless you work at it and don't dry out your lips to the point of pain. They are slightly dry but not too badly. Hera- A balm shade. A bright almost matte robin's egg/sky blue with a slight blue sheen. Leucothea- Balm shade. A true rose shade with a touch of berry to it. Lovely almost matte colour. One of my favourites from my order. Graeae- A balm shade. 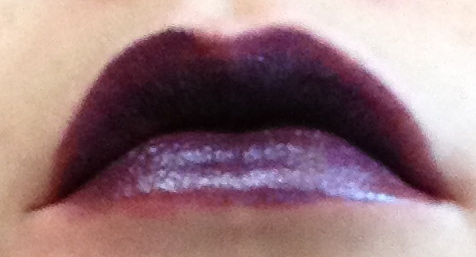 Appears almost blackened brown in the tube but applies a lovely vampy plum. I ended up liking this one a lot more than I thought I would. Aphrodite- A balm shade. A mix between bubble-gum pink and baby pink. Very bold and single coloured. I didn't like this one, not due to formula but due to how it looked on me- I was hoping for something more natural and this definitely is not. Necronomicon- Gel-Gloss formula. A very dark purple with violet and blue sparkle. Such a stunning colour but very gothic too. No way you are going to be unnoticed in this, but the formula is so comfortable I'm not sure I'd mind. 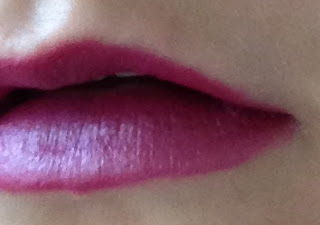 Passionfruit- Slimline Lipstick shade. Very bright fuchsia with a blue/purple reflect. 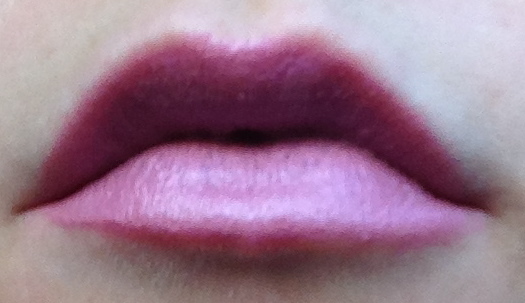 Rose Champagne- From the regular vegan lipstick line, however I think this shade was limited edition. A brown-rose with silver shimmer. Dragonscale- One of the Vegan Lipsticks. This is actually a shade that I asked Melissa from Morgana's Crypt to make for me. It's a bit pinker than I wanted but I wanted a neutralish berry shade with noticeable green shimmer to it. Unique but still out in public appropriate! You can see the green shimmer much more in real life but it doesn't look strange on the lips at all as the shimmer is so fine. Orchid- One of the lip tints. 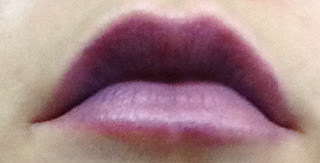 Another super dark shade in the tube (dark purple) but ends up a medium-dark purple with slight grey/mauve undertones once on. Very unique but not too out of this world. Liked this one more than I thought I would when I saw the colour in the tube. Masquerade Ball- Lipstick shade. 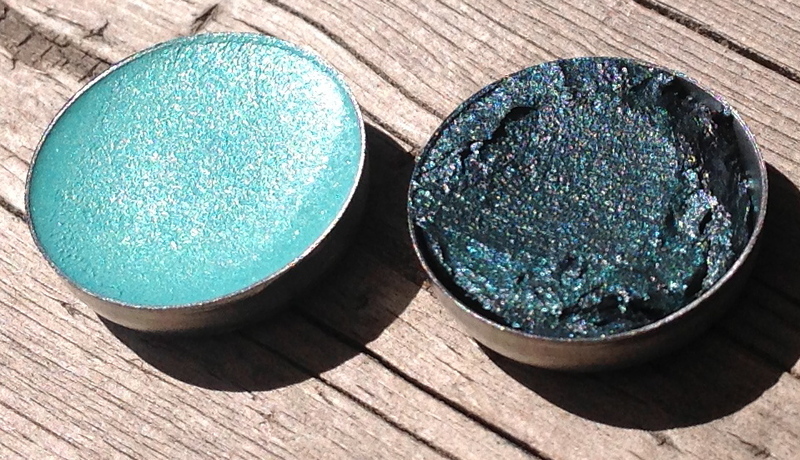 Dark green with blue undertones and blueish shimmer. Prospective Specter- Lipstick shade. Mint green with silver shimmer. I also purchased 3 of her cream shadows. I love the colours of these however the formula leaves much to be desired, even with the free powder primer included with these. They just don't set. They're very creamy and blendable but they never stop moving. To get these to work you'd need to do a heck of a lot of prep sadly. You also wouldn't want to travel with them as I fear if they were warmed up at all they would melt. And down below you can see after I rubbed these five minutes later seeing if I could give them time to set. This was with the powder primer and only one rub. Smear city. 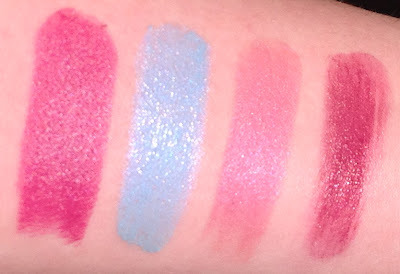 Now finally here are some lip swatches. 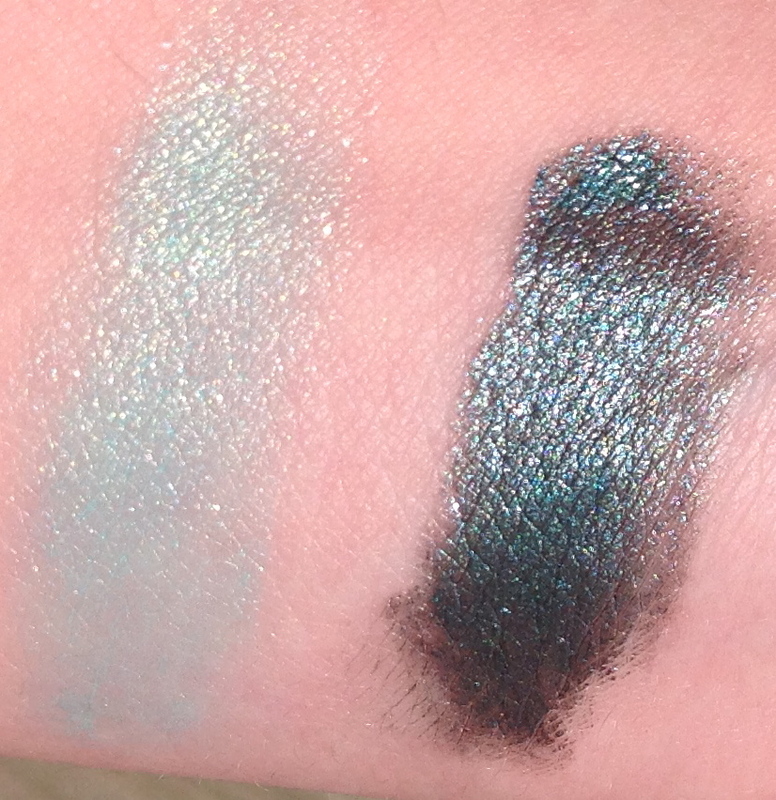 I wasn't able to swatch all the colours as I've developed an allergy to one of Morgana's ingredients. This is in no way the company's fault my sensitivity has just greatly increased and I'm also no longer able to handle sunflower seeds or sesame seeds. It's because of this allergy that I can't properly review these beyond my initial impressions unfortunately. Dragonscale- couldn't capture the green shimmer but it is there! Whew! That's everything! How about everyone else, have ordered from Morgana's Crypt? 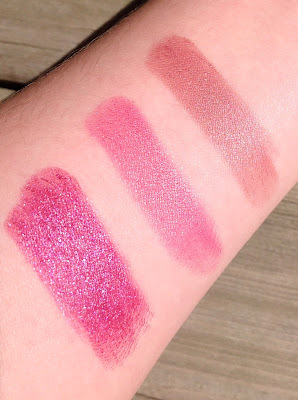 Which shades are drawing your attention?